Today at the Internationale Funkausstellung Berlin (or as we know it, IFA) Huawei launched Ascend Mate7 alongside the Ascend G7. The Mate7 features..
– A 6″ screen with FHD display for enhanced entertainment viewing. – A Slim 7.9mm body. – A octa-core chipset for superior performance. – Massive 4100 mAh battery. – Single-touch fingerprint technology and EMUI 3.0. This looks to be heading to the UK later this year. Pricing for the standard Huawei Ascend Mate7 (2GB RAM and 16GB ROM) is 499 euros (£395) whilst the premium Huawei Ascend Mate7 (3GB RAM and 32GB ROM) is 599 euro or £475. It’ll be arriving in mainland China, Hong Kong, UK, Germany, Italy, France and Spain pretty much immediately and there’s a range of accessories coming too including some UltimoPower Active Noise Cancelling Earphones that reduce noise by 15-30db. Good for the train or plane. Huawei are calling this a “smartphone”, even with the 6″ screen (which puts it really close to being a tablet) and comes with octa-core architecture. This means that the clever Huawei Kirin 925 processor uses the required CPU’s needed for the job. There’s four “large” A15 1.8 GHz CPU’s and four “small” A7 1.3 GHz chipset. They get turned on depending on the requirements of the app or game in question. End result? Better battery life. Hopefully. Berlin, Germany, September 4, 2014: Huawei today launched Ascend Mate7 at Internationale Funkausstellung Berlin (IFA) 2014, featuring a big 6-inch screen with FHD display for enhanced entertainment viewing, a slimmer 7.9mm body for increased comfort, a more powerful octa-core chipset for superior performance, and a longer-lasting 4100 mAh battery. With new single-touch fingerprint technology and EMUI 3.0, Ascend Mate7 dials up the mobile experience to make it easier for users to live life to the fullest. 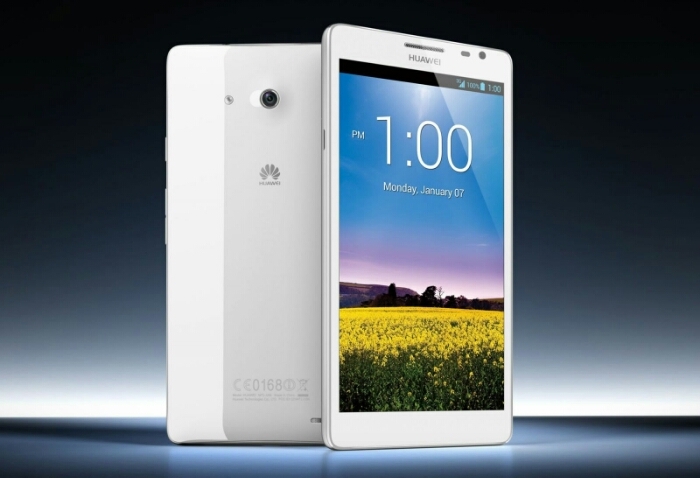 AscendMate7 is the latest big-screen smartphone from Huawei as it showcased its big ambitions as the number three smartphone vendor in the world. The recommended retail price of standard Huawei Ascend Mate7 (2GB RAM and 16GB ROM) is 499 euros, while that of the premium Huawei Ascend Mate7 (3GB RAM and 32GB ROM) is 599 euros. It will be available in more than 30 countries/territories including mainland China, Hong Kong, UK, Germany, Italy, France and Spain from Q3 2014, with other markets to follow. Accessories include the new UltimoPower Active Noise Cancelling Earphones that reduce noise by 15-30db and features for the first time, a self-charging internal battery when connected to a smartphone and two hours of use when connected to other devices, as well as leather cases and a charging stand that converts the smartphone into a digital photo frame. Podcast 108 - if only you had one of those waterproof phones!